Roanoke Ballet Theatre (RBT) is Roanoke’s non-profit school of dance, providing excellent instruction in ballet, pointe, modern, tap, jazz, and specialty classes for all ages and skill levels. 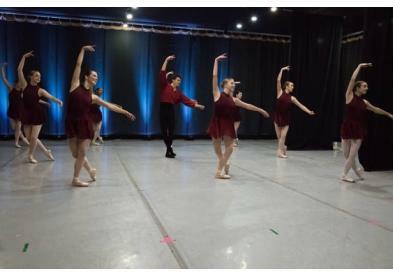 RBT maintains a performing company of professionals and student members who perform and tour throughout the year. RBT is a Center in the Square Organization and is a beneficiary of the Western Virginia Foundation for the Arts and Sciences. RBT studios and administrative offices are located in the heart of beautiful historic Grandin Village. Our accessible location offers an off street drop-off adjacent to our glass front studios and ample street and lot parking. Roanoke’s historic Grandin Village offers a pleasant selection of coffee shops, grocery stores, movies, bookstores and restaurants, all within easy walking distance of our studios. Our purpose is to: Offer excellent dance instruction in a diverse range of styles and levels. Create and sustain a challenging artistic environment. Provide a variety of performing opportunities for dancers. Offer our community a variety of opportunities to experience dance.